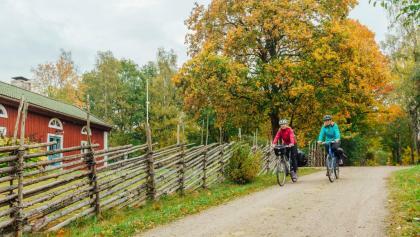 In the south of Sweden, the province of Skåne offers breathtaking scenery for extensive cycling tours. Long winding country roads, bicycle-friendly public transport and accommodation tailored to cyclists offer them everything they need. Cyclists of all kinds can bike through fields, forests and meadows or along the hilly coastline. Particularly popular are the Kattegattleden to the west and Sydostleden to the east. 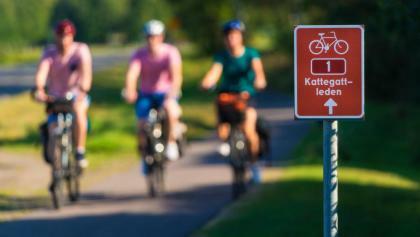 The Kattegattleden is Sweden's first national cycle route extending over 395 km from Helsingborg, one of the oldest and largest cities in Schonens, to Gothenburg, the second largest city in the country. The route leads in 8 stages without interruption through the beautiful landscape of southern Sweden past spectacular coastal sections and sandy beaches. Along the way you should stop every now and then at sights like Sofiero Castle, Kullaberg National Park or simply at a beautiful beach by the sea. The majority of the way is car-free, so that driving becomes a quiet experience. 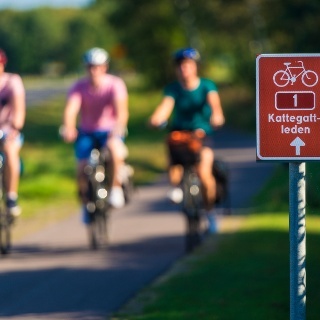 In 2018, the Kattegattleden was named the cycle path of the year in Europe. 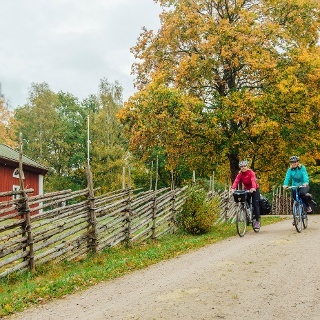 The second national cycling trail in Sweden (Sydostleden) leads from Simrishamn in south-east Skånes to Växjö in the neighboring province of Småland – or vice versa. The 7 stages and about 270 km lead through a varied landscape. In Skåne you can visit the apple orchards of Kivik, go through pastures and forests and also pass the Hallamölla waterfall, the highest waterfall in the region. In Småland you pass through deep forests and the archipelago gardens in Blekinge are also on the way. You can always take a break at the sandy beaches. The view sweeps over the wide sea. Along the paths in Skåne there are cosy restaurants, cafés and beautiful natural highlights that are well worth a stop. Some are just small detours that lead to hidden corners or great vantage points. Hotels or B&Bs are available for the overnight stay, which are located directly at the route. The third national cycle route will open in June 2019. The 230 km Sydkustleden connects the Sydostleden with the Kattegattleden. This means that cycling enthusiasts in southern Sweden have 900 km of cycle paths with good infrastructure at their disposal. From Simrishamn on the east coast, the Sydkustleden runs along the coast to Helsingborg on the west coast. You can follow in the footsteps of inspector Wallander in Ystad and visit the cosy towns of Trelleborg, Malmö and Lund. Wide sandy beaches also offer a welcome break on this way.